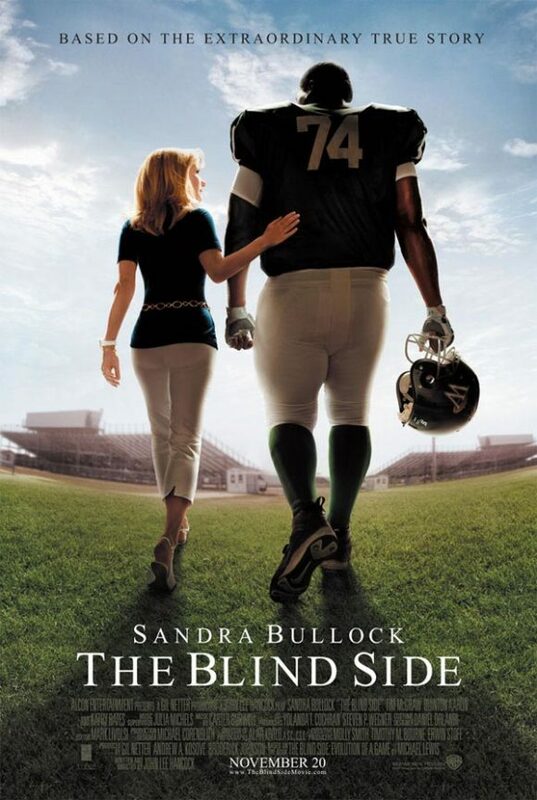 The Blind Side was an excellently made film, with superb acting and a compelling story. Sure, the “based-on-a-true-story-underdog/underprivileged-player/team-wins” genre has become quite popular, but this story still manages to stands on its own, because of it's excellence in storytelling. Sandra Bullock brings her character to life in a way that forces you into the story. You can’t help but engage in the story and like her character and all that she does. She’s funny, caring, and gets what she wants, and yet you get the sense that it's not for herself but for Mike and others. The story itself is inspiring. It gives us hope that people still care and there is good in this world. You have a young man named Mike, who though he grew up in bad circumstances, seeks to escape that lifestyle, if he only had the way. Then there is Leigh Anne (Bullock) who, though a well off woman, goes out of her way to help another person in need. She risks friends, safety, money, comfort, and more to help a kid she doesn’t even know. And yet it is that action that is so inspiring. Seeing her and her family adopt this young man into their family, helping him to aspire and achieve more than he ever dreamed of, is just good to see. Though initially afraid because of stereotypes and other barriers, they move past them to find a good man who’s just trying to find his way in this world. They are able to help him out, and in turn he helps them as well. They grow by seeing how a person with absolutely nothing can benefit from a little love. The filmmakers also played the spirituality element of the story very well. Mike went to a Christian school, and Leigh Anne wore a cross necklace throughout the entire film. But it was never "preachy." The film's "sermon" was not in words, but in the actions of the characters, who took their faith seriously, following the call of Christ to love others and serve them. And it was probably the most powerful spiritual message I have seen in a film in a long time. A film is about the actions of a character, not their dialogue. And this story portrayed characters who acted in such a way that it caused me to examine my own life and to take my actions and decisions a little more seriously. Isn't that the power of film? To cause us to see ourselves in the characters, and then bring up discussion and examination in our own lives? To provide a mirror, not of words, but images, images of action, that allow us to change as people? This film calls us all to look for those around us who need a helping hand. Who we can show love to and share what we have with those who have less. To seek out those that just need a little help, to move past our own prejudices and fears, to give unselfishly, and see someone receive the love they've never had. If we can all just help one person, if we can show them a little love, think how much the world could change. The person doesn't have to play professional football, but if they can achieve a dream they gave up hope on, what greater reward is there? For what is better than seeing a smile on a person's face because they finally have a family that loves and cares for them?